ParisBled into the Indian Ocean Exhibition set to travel! Opens at ArtGeo Cultural Complex City of Busseltion Friday 15th January 2016. 6pm to 730pm and continues to Friday 21st of February ArtGeo Gallery opens daily 10 am to 4pm. Thank you to everyone that made it to the opening night of Paris Bled into the the Indian Ocean! The evening was a success and it exceeded all of my expectations. Merenda Contemporary was in full swing, with guests, buyers, collectors and most importantly - good cheer! Although the novels by Amanda sold out on the night and the cultural tour has been booked out, there are still a few fantastic works available. The exhibition runs until next Saturday the 21st of November at Merenda Contemporary on High Street Fremantle - open from Tuesday to Sunday. It was also so wonderful to meet the new proud owner of my portrait of Kathleen O'Connor. We were able to connect together in our admiration of the great woman and artist. 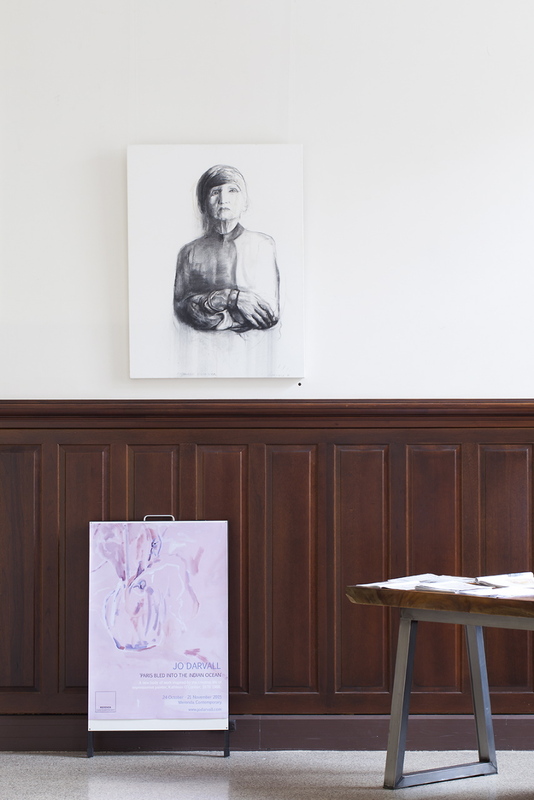 You can also catch my works in the Artist Open House Fremantle which opens tomorrow night and runs for 3 days only. Photographer and writer, Bo Wong covers a number of talented artists in this stylish-design makers event, including myself in her blog Design Satellite. Contemplating a time in history. Last year Dr. Nien Schwarz, senior lecturer at ECU had visited my exhibition 'Walking the Pipeline to the Water's End' and she was excited with the collection that she saw. I invited Nien to visit me at the studio and look at the work for the new show in the hope that she'd like to write some words in response. I was thrilled that she took that time to spend with me and create such an eloquent piece of text. Nien quotes 'I enjoyed writing about your project. I swam alongside your paintings for many delicious hours'. - she throws the majority of her treasured work into the Indian Ocean before disembarking at Fremantle. In working to comprehend why one of Australia’s most accomplished painters would feel compelled to do this Darvall established collaborations with Mike and Joy Lefroy (O’Connor family members) and Western Australian writer, Amanda Curtin. This exhibition is an opportunity to represent and celebrate the determination of creative women in the early to mid 1900s who forged on with brilliant careers that were little celebrated in their own lifetime. 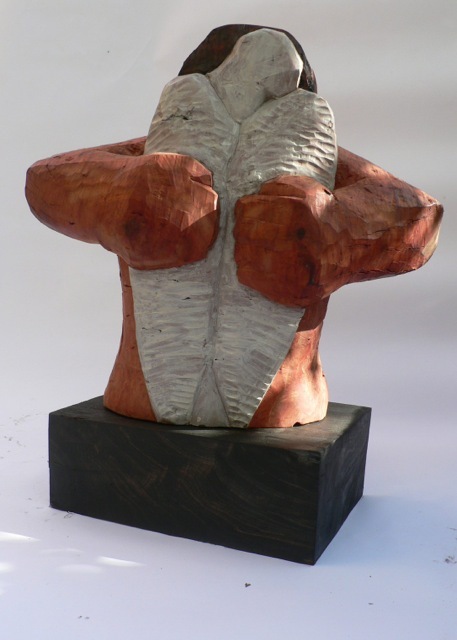 EXHIBITING: FRIDAY 23RD OCTOBER THROUGH 21 NOVEMBER 2015, TUES - SUN. 2 paintings from the last exhibition Walking the Pipeline to the waters end have been collected by Janet Holmes a'Court Collection another proud moment in my working art practice. The Western Australian Water Commission have commissioned the largest painting I will have ever painted 4 x 2 meters! Photos by Jean-Paul Horre. jeanpaulhorre@gmail.com All rights reserved. Explain the theme behind it. I want to create dialogue … with this exhibition, to ignite an activity of sharing of stories of an event that has shaped WA to this very day….the sharing of myth or fact about this wonderful West Australian legend. It’s also an incredible story of resilience for Susan, CY’s wife and her children who carried on living in WA despite the rumours, fears, lies and celebrations of their fathers stunning achievements. CY O’Connor is recognized world wide for his achievements as Engineer-in -Chief of the Fremantle Harbor and the creator of the pipeline to Kalgoorlie it is an inspiring story to paint. But the celebration is tempered by the terrible tragedy of his death at a young age and with so much more to give. The sun begins to peek over the horizon splashing pink on the brooding clouds gathered over Garden Island. Moonlight picks his familiar path down to South Fremantle beach. Time stands still as horse and master meet the waters end. What began as a deep admiration for painter Kathleen O’Connor, quickly turned to obsession for Jo Darvall as she found herself absorbed in O’Connor’s tragic family history. The first chapter of a planned three part series, Walking the Pipeline to the Waters End, explores the last days of O’Connor’s father, Western Australian Engineer in Chief, Charles Yelverton O’Connor’s, before his untimely suicide. 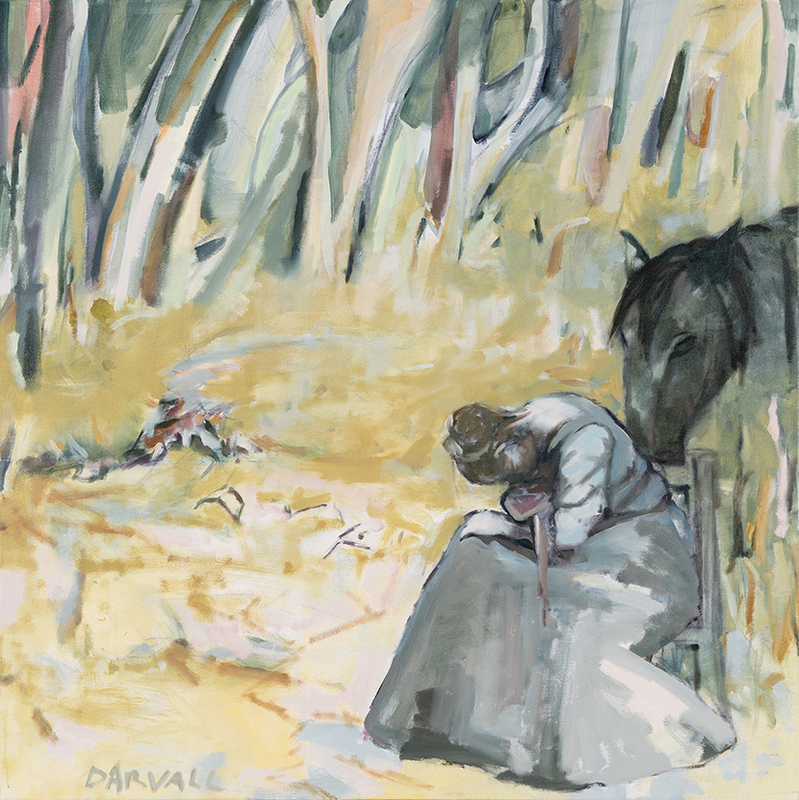 Following in the footsteps of iconic Australian painters such as Sidney Nolan, who probed the legend of Ned Kelly, Darvall unearths the great Western Australian story of a man who was ultimately driven to his demise by an ever increasing and complex workload, laced with unreasonable public expectation and media distortion. Embarking on her most ambitious exhibition to date, Darvall has visited historical sites, conducted her own research, and consulted with local Fremantle historians to reference her creation of large scale, traditional oil paintings, which delve into the myths that surround C.Y. O’Connor and question how we make sense of his legacy. Over one hundred years ago CY O'Connor carved monumental public works that we all use and access every day: Mike Nicholls and Jo Darvall pay tribute to his life and myth in a new art work of paintings and wood carvings. New Exhibition - "opens Friday 26th of September"
Large scale classic oil paintings and drawings exploring the last moments of Western Australian ledged C Y O’Connor riding his favourite horse Moonlight to the waters end. Following in the footsteps of the great Australian painters such a Nolan who explored the Ned Kelly ledged Darvall embarks her biggest challenge yet drawing upon the great Western Australian Story as her subject creating large scale traditional oil paintings, visiting historical sights, researching and consulting local Fremantle historians to create her most ambitious exhibition to date. 26 – 12 October 2014. Summoning all the five senses with merely works on paper may sound somewhat ambitious but artist Jo Darvall indeed accomplish this through her recent exhibition at Singapore’s Sculpture Square. The viewer is first greeted by an invitation to partake some rice paper wrapped Chinese White Rabbit candy - a hint as to the paper medium being selected for many of the works. As one savors the candy, soundscapes by composer Jonathan Gaboury emanate and a striking sculpture beckons from afar, bathed in ever changing intense tones while its many folds twirl and unfurl with every movement of breeze – a mesmerizing vision. With a companion series of water color works enveloping the viewer to complete the experience, Darvall stages an exhilarating and truly multisensory installation. With a mere few bold , measured strokes her paper works capture the atmosphere and expanse of the desert scapes of her home land . Yet other more abstract works erupt with vitality and energy. The works bear a strong testament to Darvall’s deft handling of contemporary ink painting with hints of distinctive traditional Chinese ink gestures. There are works created with a singular enormous brush, imbued with a unique luminosity and texture that summons up a mood of jubilation and celebration of nature’s bounty . Her palette for the encaustic works is arm and sophisticated - lyrically capturing vast lands with evocative brush marks and delicate gestures to form a charming cocktail of crimsons, brilliant yellows and earthy ochers. Supremely confident in her handling of each medium Darvall processes the possibilities and potential of rice paper , wax , paint to bring forth effects which are curiously seductive and translucent . Indeed Darvall’s Sensorium has teased and unfurled all senses. We eagerly await the unveiling of the next encounter.